I saw this on a UK model site. I liked it so I made one from an old bolt and nut. I have a nice bender I made but this one is easy to store and easy to use for those quick bends that pop up. 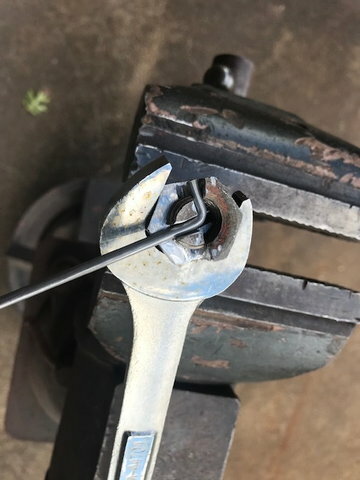 Use a wrench to make the bend. In my case a 15/16”. I’m making mine for a 5/32” wire. With a spacer or two you can bend 1/16 and 3/32” wire. Mine is not as nice as in the video but if it works it is good. Video to follow if I can get the link. 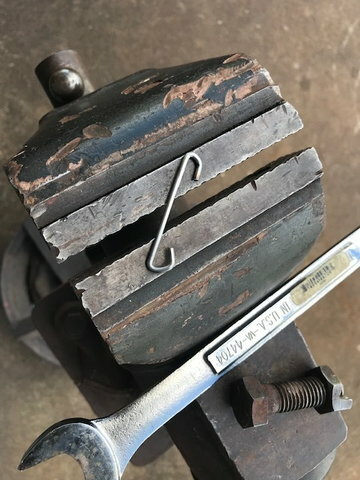 Thanks very much for sharing; yours doesn't appear to have the final cuts to the shank shown in the video. Are those cuts necessary for some applications? they show it bending the shank of a nail,....nails are made with garbage mild steel wire. I would like to see how it handles some 1/8 inch piano wire. I have a feeling piano wire might sheer the ears off the bolt that wire sits in. I left it like that so that piece is stronger. You can angle that cut so it goes a bit over 90* to allow for spring back of the wire. I made this rather quick to see how it works. I haven’t tested it in an actual application. I haven’t tested it yet on piano wire. I couldn’t find a scrap piece. Will do a test. The bolt I used is a grade 5 so stronger than a plain bolt. I made a better bender that I use. This one would be for those quick bend jobs that appear. Easy to store n set up. Will post on test. Well the test is done. It handled ⅛” music wire easily. The bend didn’t quite make it to 90*. 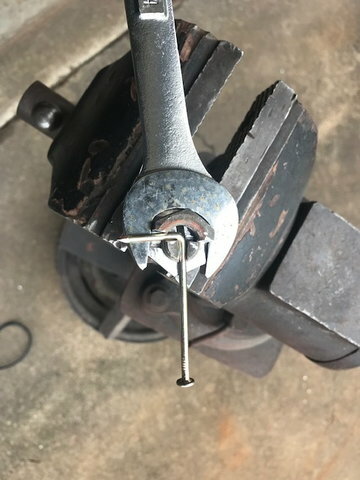 You do have to have your vice anchored pretty good. I made 2 of the small hooks out of 3/32” music wire. See my next post. I’m sure this bender will handle 5/32” wire. My plan is to make another, better quality, for 5/32” wire. Then with spacers I can use it for ⅛”, 3/32” and 1/16” wire. You do have to make your triangle piece so it provides a bend beyond 90*. Also, you need to soften the right angle point so you have gentle bend radius. 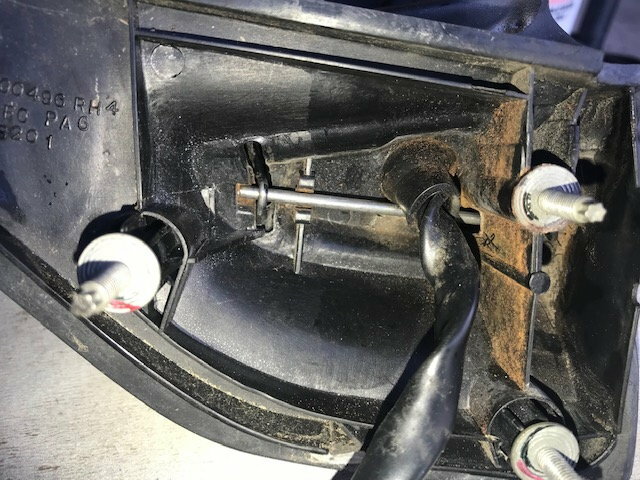 The passenger door mirror on my Jeep broke off and was hanging by the power cable. 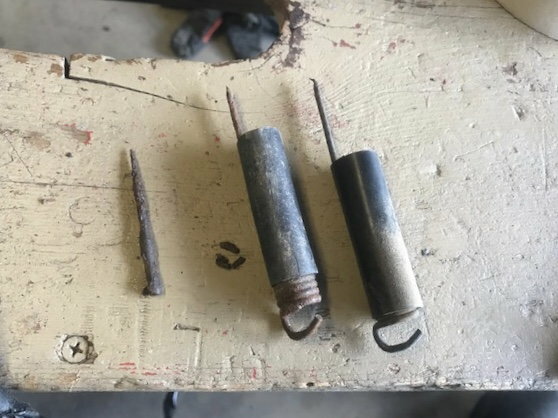 The 2 springs and steel rod had rusted away. 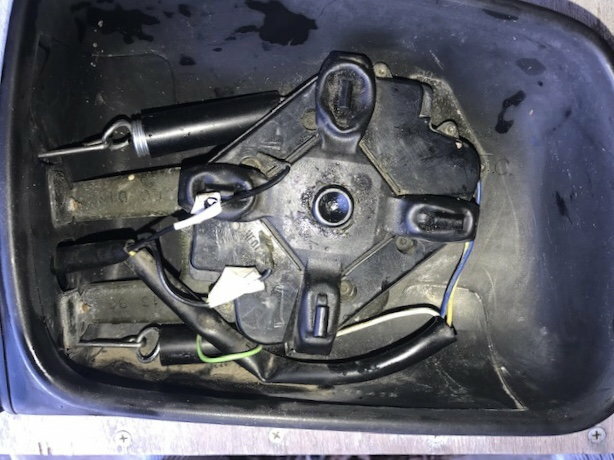 I couldn’t find the replacement springs. So I use a long spring from Tractor Supply. I cut it to make 2 springs. I used ⅛” music wire for the holding rod and the 3/32” hook to make the connection. Mirror good as new now. awesome,.... I am happy to see that it handled the piano wire well !. 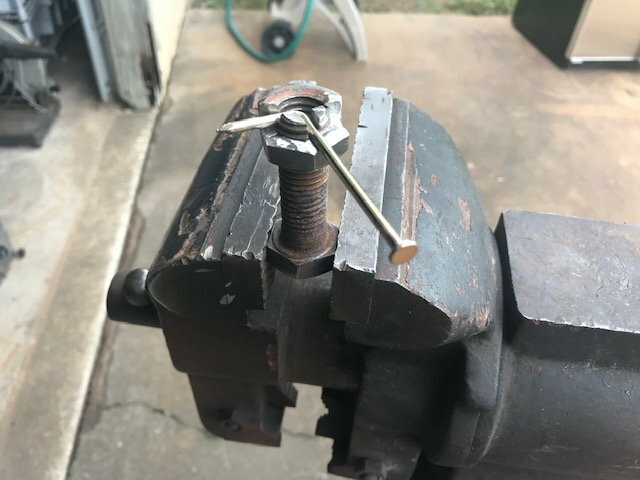 ( I was not being a "Doubting Thomas", I just know that 1/8 inch piano wire is tough and it is used quite a lot in our hobby) I can see where it would be better to radius ( or maybe just chamfer) that inside corner on the bolt. it will also make a nicer looking bend when that sharp point is gone.. Yes, piano wire is super tough. But the bender handled it easily. I may have a larger bolt for the next one. It is easy to set up and use. So it may be worth it to make one. i'll agree with that,....quick and easy to make a decent looking bend or two when you need it on some small piece. if you can get a decent looking bend on 1/8 piano wire, you're doing good !. so many times one side of the bend looks good and the other is a rounded looking affair that screams "bent with pliers".